CJA relies on both your current and future support to ensure the long-term success of our students. As we continue the process of doubling our enrollment by the 2020-21 school year, annual gifts and scholarship commitments allow us to enroll more young men each year. Another powerful way to provide for our students is to include a provision for CJA in your estate plan. Your future gift, no matter the size, helps ensure that we will be able to serve not only our current students and alumni, but also the young men who will follow in their footsteps. A bequest – or leaving a specific percentage or amount of an estate in a will – is one of the most popular options for making a planned gift to the young men of Chicago Jesuit Academy. Support of this kind can be made in the form of cash, securities, real estate or other personal property. Life insurance policies that that are no longer needed can be gifted to our students by adding Chicago Jesuit Academy as a beneficiary to the policy. This type of gift can be tax deductible if CJA is made the owner of the policy. Naming CJA as a beneficiary of a 401(k) or 403(b) retirement plan or IRA is tax-savvy and a wonderful way to support the students and alumni of CJA at the same time. Gifts made from a retirement plan are not subject to estate, federal or state income taxes allowing the full value of the gift to be recognized. 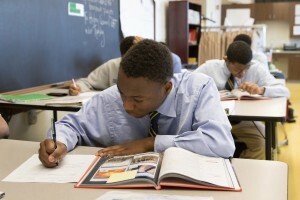 A Charitable Lead Trust would provide Chicago Jesuit Academy with an annual income (percentage or fixed amount) determined by the donor for a term of years. At the end of the term the remainder of the trust, including all unrealized appreciation, is paid to the beneficiary of the donor’s choice, free of transfer taxes. CTL’s are a tax-efficient way for benefactors in high estate and gift tax brackets to support the young men of CJA and their heirs. A Charitable Remainder Trust provides a donor with an annual income (percentage or fixed amount) during their lifetime. At the death of the last income beneficiary, the corpus of the trust would be transferred to Chicago Jesuit Academy in support of our students and alumni. Charitable gift annuities, which can be made with gifts of cash or appreciated securities, guarantee the donor a fixed annual income and provide numerous tax benefits. To set up a CGA, the donor makes a gift of cash or stock to CJA and in return CJA would provide the donor with lifetime payments. Thank you for considering how your legacy can help support our students and alumni at Chicago Jesuit Academy. If you decide to include CJA in your estate plan, we recommend that you seek the help of an estate planning attorney or tax professional. To assist you in making such a gift, below we have provided sample bequest language that can be used in a will. I give, devise and bequeath to Chicago Jesuit Academy, (Non-profit Tax ID #20-2091040) located at 5058 W. Jackson, Chicago, IL 60644, (insert sum, percentage, description of property or remainder) to be used for its general (or specify) support. If you are interested in learning more about making a planned gift to Chicago Jesuit Academy, please contact Danielle Pernini, Director of Development, via email at pernini@cjacademy.org or at (773) 638-6103 ext. 2333. Thank you for your belief in the great promise of our students and alumni.